There is debate in the medical community whether muscle tension in the neck or shoulders contributes to migraines. But there is a type of headache, called cervicogenic headache, that often contributes to headaches, if not migraines. For me personally, I frequently have issues with my neck and shoulders, and have used several of these products to reduce muscle tension and pain. Thumper Sport Percussive Massager : I was introduced to this personal massager by my chiropractor, who uses it on patients before adjustments. If I remember to use it consistently, it’s like having a personal massage therapist at my house every day. And it costs less than two massages. Plus, being able to use it on sore feet, hips, and leg muscles helps with my fibro pain and allows me to continue to be active. Spoonk Acupressure Mat + Head Rest : I learned about this product from Dr. Mark Hyman and then tried it out at the Institute for Functional Medicine’s annual conference. It’s a foam mat covered in tiny plastic spikes. When you stand or lie on it, the spikes hit many acupressure points at once, releasing all kinds of tension. Warning, it hurts like heck for the first few minutes, so ease into it. I take the travel mat with me as it fits in my carry on and I can use it on my head and neck if I get a migraine. I love having the full-size mat plus two travel sizes at home, so that I can lie down on it completely and release nearly all the tension in my body at once. There are other brands but I love this particular company, which is run by an entrepreneur named Natasha, it’s all made in the US, and they even have organic options if you prefer. 36″ Basic White Foam Roller : There are many types of foam rollers available, but this is the one I have. The others are generally way too firm for my tender fibro spots, but when I use this on a regular basis it helps loosen up my back, shoulders, hips, and even tight hamstrings. Kinesiology Tape : I have not tried this, but one of the members of my Facebook group swears by this for her neck pain. This particular brand comes with a taping guide. There is a specific taping pattern for migraine. Not a big investment, comes in a ton of colors. Aculief Wearable Acupressure Device : A colleague of mine sent me this to try out. It’s a small plastic clip that fits between your thumb and index finger, and is supposed to provide ongoing relief (or acute relief) of headaches by pressuring the LI4 acupressure point. I confess that I haven’t had noticeable results, but if you’ve had this spot needled and it’s provided relief, then this might work for you. Make your own tool at home: For this you’ll need a clean tube sock (long, white athletic sock without a heel), two tennis balls (can be spent from play), and two thin plastic zip ties. Push the tennis balls down to the bottom of the tube sock as far as you can, then pull the fabric over them snugly. Gather the sock fabric around the balls with the zip tie as snugly as possible. Snip off the long end of the zip tie. Now reverse the remaining sock fabric over the tennis balls (doubling the fabric over them) and use the second zip tie to snugly secure the end. Trim the excess zip tie. (There will be a small “tail” of sock left.) To use, lie on your back on the floor (carpeted is best) and place it behind your head, so that the tennis balls press on either side of your spine. Relax into the position for as long as needed, then move the tool downward a little. Repeat until you get to your lower back. You can also use this to loosen up your hips and to release tension from your feet. ICEKAP—Cooling and warming compress cap for headaches and migraines : There are several brands; this one was designed by a migraine sufferer and features a pony-tail opening in the back. A few notes: With the ice packs in, this is heavy. I would not be able to wear it standing up without it hurting my neck (which is over-sensitive). They run smaller, so I would order an extra-large, since it has velcro to tighten it as an option. The packs aren’t easy to get into the pouches if they are frozen, so you’ll need to store the entire thing assembled in the freezer. Gel Ice Cold Compress (2 Pack) : This is what I have in my freezer. One goes on my forehead, one the back of my head while I wait for my triptan to kick in. Make a rice sock at home: To make your own inexpensive and reusable rice sock, take a clean tube sock (long, white athletic sock without a heel) and fill with dried white rice. Knot or stitch the end closed. Heat in a microwave for 1-2 minutes to create a moist heat pack that sits across your neck and shoulders. This can also be frozen, if a weighted ice pack would feel better for you. The rice holds the temperature for a fairly long time, and moist heat is better for muscles than dry heat from a heating pad. Salonpas Pain Relieving Patch : These have been my go-to for back and hip pain for years. I have sometimes used them on my neck, although the strong smell can be problematic. Then one of my readers asked me why I wasn’t using unscented lidocaine patches, and the light bulb went off. In the past, I have also used Tiger Balm , but the smell is still strong which can be an issue for migraines. Note that you want the white version, the dark red version will stain your clothing. Aspercreme With Lidocaine : Now I use this when my neck and shoulders are killing me. No smell, and the cream is a lot easier to use on a neck, as patches don’t stick well. Migrastil Roll-on Relief : I have not tried any of these roll-ons, except one from Aveda that was supposed to help with headaches. I’ve seen people attribute miraculous powers to these. If you have strong scent aversion these might not be a good choice for you. Custom earplugs: Might be helpful if you are very sensitive to weather (barometric pressure) changes or have high noise sensitivity. This company has off-the-shelf products, but if you are thinking about doing this, consider having an audiologist do ear molds for you and having custom-fitted ones made. One nurse with migraine that I met swears by hers, which still allow her to hear in the workplace but help greatly with her attacks. Also recommended if you fly a lot or are in noisy environments. Natural silk sleep mask : Having a good eye mask that completely blocks light has been a game changer for me, as I am someone with light sensitivity. I use this during attacks, and find it essential for travel, as it allows me to sleep on planes and in hotel rooms and AirBnBs. The only issue with these is whether they are too tight. I got lucky with the fit on mine. IMAK Compression Pain Relief Mask and Eye Pillow, Cold Therapy for Headache, : Here’s one that is also a cold pack. Migraine glasses: These have been a huge help for me, especially when flying as the lighting in airports is uniformly terrible. There are two brands, both designed for migraines. Axon Optics blocks the FL-41 portion of the light spectrum, and they are literally rose-tinted. (I wear these). They are designed by researchers at the University of Utah. TheraSpecs was founded by migraine advocate Kerrie Smyres and her husband, and they block a somewhat different portion of the light spectrum. Their lenses are more yellow. Again, as everyone is different, you might need to try each brand if one doesn’t work for you. Both have a money-back guarantee policy (Axon Optics: 30 days, TheraSpecs: 60 days). CBD oil: As noted above, there is no dosing information on this. Once it becomes legal in California next year, I will be doing more investigating about particular strains. This form is legal in all 50 states. Not cheap, because it is essentially a medication. Riboflavin: Vitamin B2, 200 mg in the morning and 200 mg at night is the recommended dose. Good research behind its use. Magnesium: The daily recommended dosage is 360 mg. I personally find it helpful as a sleep aid, so I take my entire dose about an hour before bed. Note that it can cause tummy upset, so work your way up to this level. Feverfew: 100 mg per day. Look for MigreLief original, which provides all three supplements in the proper dosage. They suggest trying it for 3 months, noting any improvement in your symptoms. If you see improvement, continue taking. Note that I have seen some research indicating that getting OFF feverfew could contribute to rebound headaches, so be aware of this. 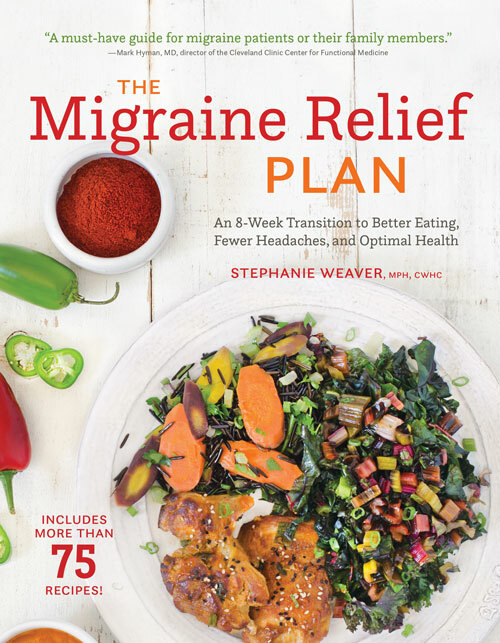 Riboflavin, magnesium, and feverfew are the only three supplements with strong evidence to suggest that they help reduce frequency and intensity of symptoms. Ginger Root Capsules : Ginger root is widely used to reduce nausea. I frequently use it when I have symptoms coming on by emptying two capsules into a small amount of water and drinking that (so that the powder can go right to work). I also take crystallized ginger on flights with me in case I get motion sickness. Yogi Tea: Ginger is also helpful. Sea-Band Adult Wristband : These wristbands have a plastic bead sewn inside that puts pressure on the anti-nausea acupressure point. They include instructions on exactly how to place them (or they don’t work). Note that they are fairly tight in order to provide the correct pressure, which can be uncomfortable for long periods of time. There are endless versions of mindfulness and relaxation CDs (assuming you still have a CD player). I love this book You Are Not Your Pain: Using Mindfulness to Relieve Pain, Reduce Stress, and Restore Well-Being—An Eight-Week Program and it comes with 8 guided meditations on a CD. Also check out Dr. Dawn Buse for free guided meditations. Other resources to look for would be Dr. Andrew Weil, Deepak Chopra (who offers free 21-day online meditation programs for free), and Jon Kabat-Zinn. Biofeedback has been used for many years with chronic pain patients, and it’s the one area of non-drug interventions that all doctors seem to agree upon. You can go to a center (sometimes covered by insurance with a doctor’s prescription) to learn techniques, but the basics are using some sort of device to give you real-time feedback on your body’s rhythms, such as your heart rate or breathing. Inner Balance: This is the device I have because it’s easy to use, it’s pretty, and the research on heart rate variability training is impressive. It helps retrain an overactive nervous system to calm down. 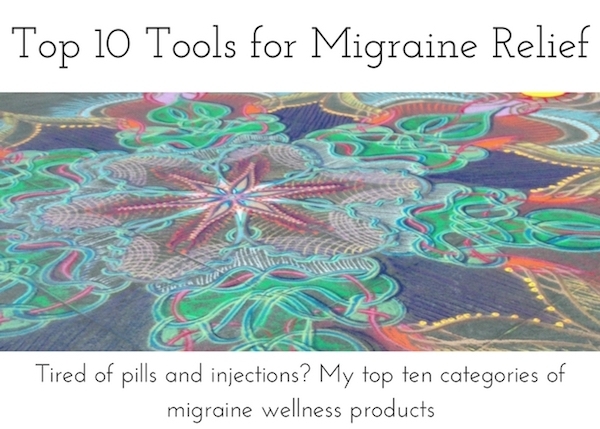 This can help with both migraine attacks as well as chronic pain conditions like fibromyalgia. You clip the sensor on your earlobe and plug the other end into your phone or tablet, then start a session. It teaches you to sync up your heart rate and your breathing. You have to do it regularly to see long-term benefit, but short-term it helps with stress and anxiety. This is in the biofeedback realm, just without the feedback. You follow the prompt to shift your breathing, slowing it down into a rhythm that overrides the sympathetic (fight or flight) nervous system, engaging the parasympathetic (rest and digest) system that infuses your body with pain-mediating chemicals like oxytocin and endorphins. Download one of these apps and practice with it. Hold the pauses as long as it feels comfortable. Your goal is to be breathing less than 7 times per minute. PC app: Download Ez-Air Plus (30 day free trial, then a one-time fee of $20). And finally, there are several new external electrical stimulation devices such as Cefaly and eNeura. These require a prescription and are rented out by the user. Cefaly is used daily (it looks like a Wonder Woman headband with a stick-on electrode) and eNeura is used on the back on of the neck both as a preventive and during an attack. Have you tried any of these? Please join our Facebook group to share your experience. Please note that I do not respond to queries asking me to add links to this page. Thanks. Great tips. I am very hesitant on supplements so I prefer your other tips. I own a Tins so may try that next time on my forehead or back of my neck.